For the peer, see Alistair Cooke, Baron Lexden. For the English cricketer, see Alastair Cook. 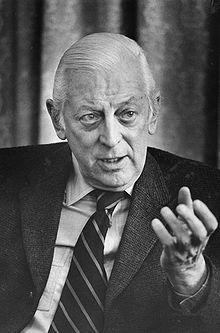 Alistair Cooke KBE (20 November 1908 – 30 March 2004) was a British writer whose work as a journalist, television personality and radio broadcaster was done primarily in the United States. Outside his journalistic output, which included Letter from America and America: A Personal History of the United States, he was well known in the United States as the host of PBS Masterpiece Theatre from 1971 to 1992. After holding the job for 22 years, and having worked in television for 42 years, Cooke retired in 1992, although he continued to present Letter from America until shortly before his death. He was the father of author and folk singer John Byrne Cooke. He was born Alfred Cooke in Salford, Lancashire, England, the son of Mary Elizabeth (Byrne) and Samuel Cooke. His father was a Methodist lay preacher and metalsmith by trade; his mother's family were of Irish Protestant origin. He was educated at Blackpool Grammar School, Blackpool and won a scholarship to Jesus College, Cambridge, where he gained an honours degree (2:1) in English. He was heavily involved in the arts, was editor of Granta, and set up the Mummers, Cambridge's first theatre group open to both sexes, from which he notably rejected a young James Mason, telling him to stick to architecture. Cooke changed his name to Alistair when he was 22, in 1930. Cooke saw a newspaper headline stating that Oliver Baldwin, the Prime Minister Stanley Baldwin's son, had been sacked by the BBC as film critic. Cooke sent a telegram to the Director of Talks, asking if he would be considered for the post. He was invited for an interview and took a Cunard liner back to Britain, arriving twenty-four hours late for his interview. He suggested typing out a film review on the spot, and a few minutes later, he was offered the job. He also sat on a BBC Advisory Committee headed by George Bernard Shaw for correct pronunciation. Cooke was also the London correspondent for NBC. Each week, he recorded a 15-minute radio dialogue for American listeners on life in Britain, under the series title of London Letter. In 1936, he intensively reported on the Edward VIII abdication crisis for NBC. He made several talks on the topic each day to listeners in many parts of the United States. He calculated that in ten days he spoke 400,000 words on the subject. During the crisis, he was aided by a twenty-year-old Rhodes Scholar, Walt Rostow, who would become Lyndon B. Johnson's national security advisor. Cooke's first visit to the United States was in 1932 on a two-year Commonwealth Fund Fellowship, now Harkness Fellowship to Yale and Harvard, where his acting and music skills came to the fore with visits to Hollywood. He replaced Oliver Baldwin as the BBC's film critic on 8 October 1934 and gave his first BBC broadcast: "I declare that I am a critic trying to interest a lot of people into seeing interesting films,” he told his audience. “I have no personal interest in any company. As a critic I am without politics and without class." Thus very soon in 1937, Cooke emigrated to the United States; but became a United States citizen and swore the Oath of Allegiance on 1 December 1941, six days before Pearl Harbor was attacked. Shortly after emigrating, Cooke suggested to the BBC the idea of doing the London Letter in reverse: a 15-minute talk for British listeners on life in America. A prototype, Mainly About Manhattan, was broadcast intermittently from 1938, but the idea was shelved with the outbreak of World War II in 1939. During this time, as well, Cooke undertook a journey through the whole United States, recording the lifestyle of ordinary Americans during the war and their reactions to it. The manuscript was published as The American Home Front: 1941–1942 in the United States (and as Alistair Cooke's American Journey: Life on the Home Front in the Second World War in the UK) in 2006. The first American Letter was broadcast on 24 March 1946 (Cooke said this was at the request of Lindsey Wellington, the BBC's New York Controller); the series was initially commissioned for only 13 installments. The series came to an end 58 years (2,869 installments) later, in March 2004. Along the way, it picked up a new name (changing from American Letter to Letter from America in 1950) and an enormous audience, being broadcast not only in Britain and in many other Commonwealth countries, but throughout the world by the BBC World Service. In 1947, Cooke became a foreign correspondent for the Manchester Guardian newspaper (later The Guardian), for which he wrote until 1972. It was the first time he had been employed as a staff reporter; all his previous work had been freelance. In reporting on the Montgomery bus boycott, begun by Rosa Parks and led by Martin Luther King, Cooke expressed sympathy for the economic costs imposed on the city bus company and referred to Mrs. Parks as "the stubborn woman who started it all ... to become the Paul Revere of the boycott." In 1952, Cooke became the host of CBS's Omnibus, the first commercial network television series devoted to the arts. It featured appearances by such personalities as Hume Cronyn, Jessica Tandy, Gene Kelly and Leonard Bernstein. Jonathan Winters was the first comic to appear on the show. In 1966 he was invited to deliver the MacMillan Memorial Lecture to the Institution of Engineers and Shipbuilders in Scotland. He chose the subject "The Jet Age and the Habits of Man". In 1971, he became the host of the new Masterpiece Theatre, PBS's showcase of quality British television. He remained its host for 22 years, before retiring from the role in 1992. He achieved his greatest popularity in the United States in this role, becoming the subject of many parodies, including "Alistair Cookie" in Sesame Street ("Alistair Cookie" was also the name of a clay animated cookie-headed spoof character created by Will Vinton as the host of a video trailer for The Little Prince and Friends); Alistair Quince, portrayed by Harvey Korman, who introduced many episodes in the early seasons of Mama's Family. America: A Personal History of the United States (1972), a 13-part television series about the United States and its history, was first broadcast in both the United Kingdom and the United States in 1973, and was followed by a book of the same title. It was a great success in both countries, and resulted in Cooke's being invited to address the joint Houses of the United States Congress as part of Congress's bicentennial celebrations. After the series' broadcast in Ireland, Cooke won a Jacob's Award, one of the few occasions when this award was made to the maker of an imported programme. On 2 March 2004, at the age of 95, following advice from his doctors, Cooke announced his retirement from Letter from America—after 58 years, the longest-running speech radio show in the world. Cooke died at midnight on 30 March 2004, at his home in New York City. He had been ill with heart disease, but died of lung cancer, which had spread to his bones. He was cremated, and his ashes were clandestinely scattered by his family in Central Park. On 22 December 2005, the New York Daily News reported that the bones of Cooke and many other people had been surgically removed before cremation by employees of Biomedical Tissue Services of Fort Lee, New Jersey, a tissue-recovery firm. The thieves sold the bones for use as medical-grade bone grafts. The cancer from which Cooke was suffering had spread to his bones, making them unsuitable for grafts. Reports indicated the people involved in selling the bones altered his death certificate to hide the cause of death and reduce his age from 95 to 85. Michael Mastromarino, a former New Jersey-based oral surgeon, and Lee Cruceta agreed to a deal that resulted in their imprisonment. Mastromarino was sentenced on 27 June 2008, in the New York Supreme Court, to 18 to 54 years' imprisonment. The entire story of the theft featured in a documentary aimed at educating the public about modern-day grave robbery. On the morning of 7 July 2013, at age 49, Michael Mastromarino died at St. Luke's Hospital after suffering from liver cancer. Cooke became engaged to Henrietta Riddle, the daughter of Henry Ainley. While he was attending Yale University and Harvard University on a Commonwealth fund fellowship, she deserted him. He met Ruth Emerson, a great-grandniece of Ralph Waldo Emerson, in 1933, and they married on 24 August 1934. Their son, John Byrne Cooke, was born 5 October 1940 in New York City, New York. Alistair Cooke divorced Ruth in 1944, and married Jane White Hawkes, a portrait painter and the widow of neurologist A. Whitfield Hawkes, the son of Albert W. Hawkes, on 30 April 1946. Their daughter, Susan, was born on 22 March 1949. Cooke took up golf in his mid-fifties, developing a fascination with the game, despite never attaining an extraordinary level of skill. He was driven by his love of golf to devote many of his Letter from America episodes to the topic, speaking once of the thrill of learning "how much more awesome was the world of golf than the world of politics." Cooke became close friends with many of the leading golfers of the era: Jack Nicklaus, in the introduction to a compilation of Cooke's writing on golf, recounts his many notable achievements, but describes him as "most of all ... a friend." In a broadcast talk on the BBC on 2 May 1997, referring to the success of the golfer Tiger Woods, Cooke claimed that "There'll be a spectacular increase in the number of black boys, and I do mean boys, teenagers, who begin to infest the public courses in America." In 1968, he was only yards away from Robert F. Kennedy when he was assassinated, witnessing the events that followed. In 1973, Cooke was awarded an honorary knighthood (KBE) for his "outstanding contribution to Anglo-American mutual understanding." Cooke was reportedly happy to accept, because in the words of Thomas Jefferson, it did not involve "the very great vanity of a title." Having relinquished his British citizenship during World War II, he could not be called "Sir Alistair". After Alistair Cooke's death the Fulbright Alistair Cooke Award in Journalism was established as a tribute to the man and his life and career achievements. The award supports students from the United Kingdom to undertake studies in the United States, and for Americans to study in the United Kingdom. Letters from America (1951) Rupert Hart-Davis, London – with introduction "To the British Reader"
One Man's America (1952) Alfred A Knopf, New York – same chapters as 'Letters from America' (1951), with introduction "To the American Reader"
Reporting America: The Life of the Nation, 1946–2004. Allen Lane. 2008. ISBN 978-1-84614-047-1.
Review: Saunders, Alan (March 2009). "Last Man Standing". The Monthly. 43: 50–52. Review of Reporting America: The Life of the Nation, 1946–2004. Cooke also co-authored several "coffee table books". America: A Personal History of the United States has been released on DVD, with an additional feature where Cooke talks about his life. An Evening With Alistair Cooke at the Piano, an LP record first released in 1955, later re-released in 1973 by Columbia Special Products (catalogue number B00110SXCK). The album features Cooke playing jazz standards on piano with accompanying whistle and speaking about his life in America. ^ George Perry Archived 3 December 2008 at the Wayback Machine "The War at Home: Near Filed 60 Years Later," American Heritage, Aug./Sept. 2006. ^ "About The Center". BU.edu. Howard Gotlieb Archival Research Center, Boston University. Archived from the original on 28 August 2016. Retrieved 29 August 2016. ^ "Alistair Cooke". 30 March 2004. ISSN 0307-1235. Retrieved 25 June 2018. ^ Clarke, Nick (2000). Alistair Cooke: A Biography. Arcade Publishing. ISBN 9781559705486. ^ Meikle, James (14 November 2012). "Alistair Cooke correspondence sheds light on reporting dark days of 1968". Guardian. London. Retrieved 14 November 2012. ^ Jeanne Theoharis (29 January 2013). The Rebellious Life of Mrs. Rosa Parks. p. 114. ISBN 978-0-8070-5048-4. ^ "THE JET AGE AND THE HABITS OF MAN". Naval Engineers Journal. 79 (5): 784–790. 1967. doi:10.1111/j.1559-3584.1967.tb05134.x. ISSN 0028-1425. ^ DeCaro, Frank (11 October 2013). "'Mama's Family' returns for more biting, home-spun humor on DVD". Los Angeles Times. ISSN 0458-3035. Retrieved 25 June 2018. ^ "Alistair Cooke". BBC News. Archived from the original on 2 April 2004. Retrieved 25 May 2013. ^ "Alistair Cooke's bones 'stolen'". BBC News. 22 December 2005. Retrieved 23 April 2010. ^ Howard, Kate (30 May 2004). "Alistair Cooke's ashes scattered in Central Park". London: The Daily Telegraph. Retrieved 21 August 2007. ^ Zahn, Paula (9 January 2006). "Paula Zahn Now". CNN. Retrieved 21 August 2007. ^ "Plea deal in US body parts case". BBC News. 16 January 2008. Retrieved 23 April 2010. ^ "Mastermind of body parts scheme sentenced to prison". CNN.com. 27 June 2008. Archived from the original on 29 June 2008. ^ Slotnik, Daniel E. (8 July 2013). "Michael Mastromarino, Dentist Guilty in Organ Scheme, Dies at 49". The New York Times. Retrieved 29 August 2016. ^ "John Byrne Cooke". Discogs. Retrieved 25 June 2018. ^ a b c Cooke, Alistair (2008). The Marvellous Mania: Alistair Cooke on Golf. London: Penguin Books. ISBN 978-0-14-103101-9. ^ "Tiger Woods' ethnicity, Letter from America by Alistair Cooke - Tiger Woods' ethnicity - 2 May 1997 - BBC Radio 4". ^ "The death of Senator Robert Kennedy". BBC News. Archived from the original on 16 October 2002. Retrieved 25 May 2013. ^ Brogan, Patrick (12 April 1973). "Knighthood is conferred on Alistair Cooke". The Times (58756). p. 1. ^ "Fulbright-Alistair Cooke Award In Journalism | International Scholarships Search | IEFA". International Scholarships Search | IEFA. Retrieved 25 June 2018. ^ "Alistair Cooke | US-UK Fulbright Commission". www.fulbright.org.uk. Retrieved 25 June 2018. Alistair Cooke (obituary) by Nick Clarke, The Guardian, March 31, 2004. "Alistair Cooke, Elegant Interpreter of America, Dies at 95" (obituary) by Frank J. Prial, The New York Times, 31 March 2004.